Add water, mussels, prawns, ginger, white wine into a pot. Cook with medium high heat until mussels open shell. Take out mussels and prawns, remove both mussels and prawn shells. Remove any sediment from the broth with a sieve. Keep the broth for later use. Add butter in a large saucepan and melt it with low heat, add shallot and stir fry with medium heat till soft. Add in pumpkin and stir fry for a while. Add the broth that from cooking mussels and prawns, simmer for around 20 minutes or until the pumpkin is soft. Transfer the soup mixture to a blender and blend until smooth. Return to the saucepan. Add milk, salt and pepper, mussels and prawns. Warm over medium low heat for a minute. 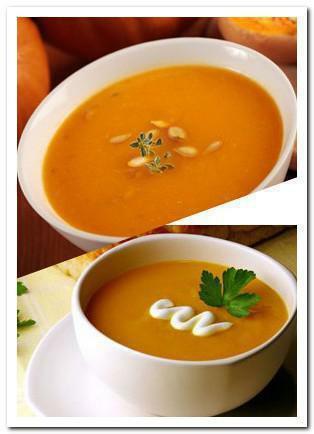 Pumpkin soup is smooth and creamy. It can be a simple meal serving with crouton, bread or French loaf. You can try to advance the flavors with some toppings such as cream, yogurt, herbs or crispy bacon. It is a good appetizer too. Pumpkin is a popular dish on the table during Halloween and Thanksgiving.